I've just moved into a new apartment. There are boxes stacked up everywhere, yet I'm trying to make things feel like home. It's getting there...just more slowly than I'd like. One thing that is pretty much guaranteed to make a new place feel like home is a home-cooked meal. And this soup fits the bill nicely. I made this soup last month while I was packing up the old place and trying to use up bits from my cupboards. The results were pretty spectacular and it makes for a simple and delicious meal that you can whip up quickly. 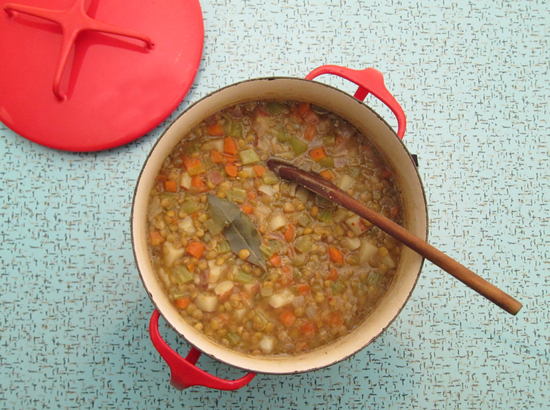 The key with this soup is to keep all the vegetables similar in size to the lentils. That means keep your dice small and uniform. 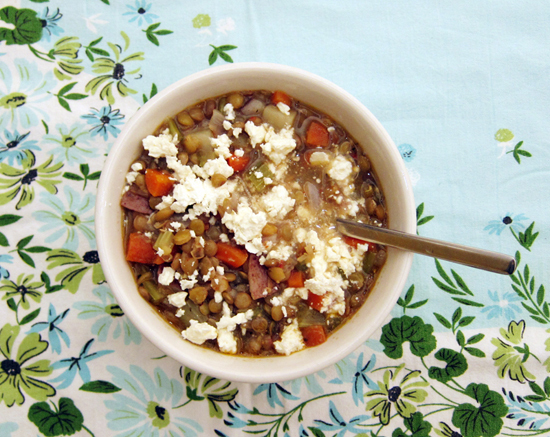 Your vegetables and lentils will cook quickly, plus there's the added aesthetic bonus too! Add in more stock for a more soupy bowl, less for something more stew-like. In a large saucepan, heat olive oil over medium heat and add in the onion, garlic, carrot and celery. Stir everything around and let it get fragrant for a few minutes. Add in the potato, lentils, bay leaves, herbs due provence, cumin and chili flakes along with the chicken or vegetable stock. Cover and let simmer over medium heat until it boils, then turn down to a low heat. 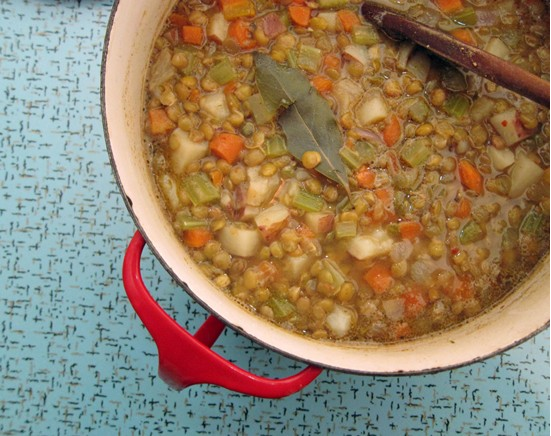 Continue to simmer until vegetables and lentils are tender. Add in lemon juice along with salt and pepper, if needed. Serve in deep bowls alongside some crusty bread or biscuits. Top with feta, if desired. That's a very usual dish in my country!I love it! I don't know why but I've only recently started cooking with lentils and I'm loving it. Adding this one to my must try list. 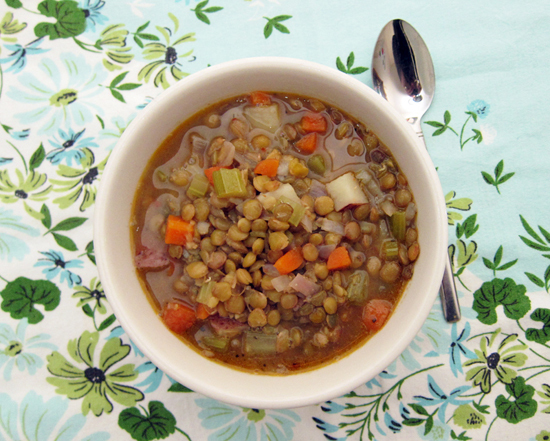 I love lentil soup, espcially because it lends itself to so much variation. I'm defintely going to try yours; the feta idea is GENIUS! I made this today and it was FANTASTIC! Funny! I cooked a similar lentil stew on friday. So yummy with some fresh bread. Enjoy and good luck unpacking. This recipe has become one of my all-time favorites. My whole family loves it, it's delicious, nutritious, and quick to make. A total winner! Made this for dinner tonight. Did not have Herbs du Provence, but looked up a recipe for it and added a pinch of what I had. DELICIOUS! Had some mushrooms I needed to use and added them and a little extra ketchup. SOOOOOO good!!! Thank you for sharing!